As I've mentioned numerous times, I'm pretty blind and cannot live without my glasses and contact lenses. And this post is about a handy site which was made for a person like me! Lenskart.com is an Indian online store for eyeglasses, sunglasses, contact lenses, prescription lens and powered sunglasses. They have a wide range of eyewear from various brands all across the world for men, women and children. Lenskart eyeglasses include varieties that are rimmed, rimless, half rim and for reading while their range of sunglasses has various shapes and styles in different colors. Whether you're looking for a pair of aviators, cat eyed, wayfarer, oval, round or rectangular frame, Lenskart India has got it. 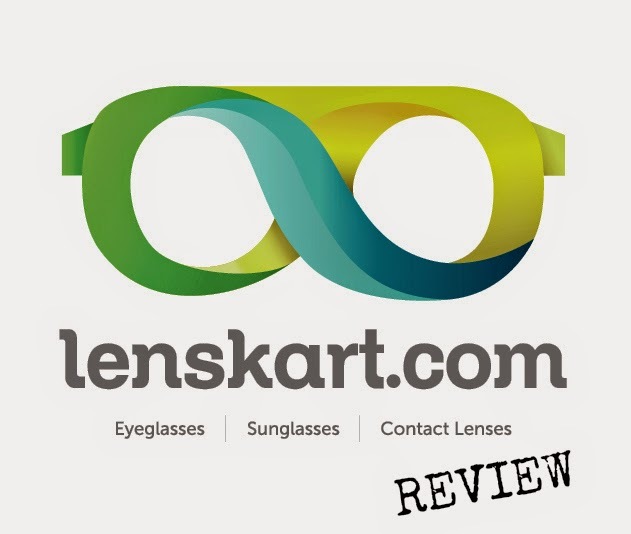 A lot of people may have apprehensions about ordering eyewear online but Lenskart makes it all so amazing and simple. The site has detailed information about each frame type, material, bridge size, temple size and eye size. It also gives you a virtual try on option where you can upload your photograph and see how it looks on you. This tool, known as the virtual eyewear studio, is really cool as you can rotate and tilt your photo and the eyewear and place it perfectly to see whether it suits you. And in case you don't have a webcam there are various pictures of models of different face shapes which would give you a better idea of how it would look on you. This is a really stellar feature as it really helps customers clear all their doubts before making a purchase. I don't have a webcam so I uploaded a photo of myself to check out how this pair of Raybans would look on me. Nice, right? Time to save up! Or maybe not, since they even have an EMI option to purchase eyewear! For contact lens wearers like me, they have numerous brands with lots of options and even stock colored lenses! I have a bunch of friends who've bought lots of funky glasses from Lenskart and they loved the products and service. Oh, and I forgot to mention that they are way cheaper than physical optical stores and give you a superb range of styles and brands compared to them. So if you're based in India and looking for a great eyewear solution, Lenskart.com is the site to check out! Would you buy eyewear online or prefer to shop the traditional way? Great looking glasses. Have a great weekend June. That virtual try on feature is super cool, June:) Looks like a cool site to buy your glasses. You know everybody in my family has glasses , so lensekart is can be a family store for us. Pluse I really like that we can upload pics and see how a perticular frame looks on. U can't see without glasses, hehe , that's how my bro is .. I always make fun of him. They have some really chic pairs! ....Have a splendid weekend! wonderful post, looks like a great site! I like shopping online! Haven't tried it for eyeglasses though. Thanks for sharing the info. I look terrible in glasses, it's one of my great sorrows in life. Those look great on you! I love how easy this site seems to be. Those sunnies look great on you! I like how easy this site seems to be. I love sunglasses and can never have enough! You look great in them! I still prefer shopping traditional way, especially when it comes to glasses and lenses. I manage to buy the wrong sort of glasses when I try things out, so what would happen if I didn't even get to test them properly!!? Thanks for sharing, June! It's not the first time that I have bought glasses online and with great outcome. I'll try out this site. I've always wanted to wear glasses! I tried to fake an eye test when I was younger, haha. I invite you to follow me too, it would mean a lot to me. Cool site, amazing shades they have there.. I need also my glasses, without them my life would be kind of difficult ... but I'm not able to wear lenses. Of this cause I thank you for this post, now I have to check if they deliver to Germany! Looks like they have a great selection of frames! I've brought sunglasses before online and I've been lucky enough to be happy with the end result. Only once did I have to return a pair and they were Ray Bans because they didn't match my face! I also really need to get my eyes checked since I can't exactly see things from afar. Its been a while now and I thought maybe they'd get better, you know! LOL I know how silly that sounds! I really should get them checked - and soon. But in the meantime, I'll check these guys out. Thanks for the FYI and thanks for visiting my blog and leaving such kind words! Great post June. Cool looking glasses. Have a great start into your week. Btw I already follow you. Very nice glasses and website! I follow your blog, follow back? I do not wear glasses but I would probably like to shop the traditional way. I like to see how they look on me. I would forget to return the box although I do like the large selection they offer. Enjoy your time. Thanks for visiting my blog. this is a great thing!!! Great and a very useful blog for me. It contains a lot of information's. Thanks a lot for sharing.